No matter where you live there are times the room you are in just seems a little cold. Why waste all that energy heating the whole house when you can easily move this energy efficient space heater from Duraflame into any room it’s needed in. Not only does the Duraflame Maxwell Electric Stove with Heater work great but it has a very pleasing look to its exterior too. This nice little space heater model from Duraflame is loaded with power. A full 4500 BTU’s of heat generating capability to be exact that can easily add extra heat to up to 400 square feet of living space. That is enough power to easily heat up even a large size room if this space heater is placed in it. This unit is rated at a reasonable 1500 watts of energy use. The controls on it are very simple to operate also. It even comes with a full range temperature setting switch so you can fine-tune its heat output to just the way you like it. 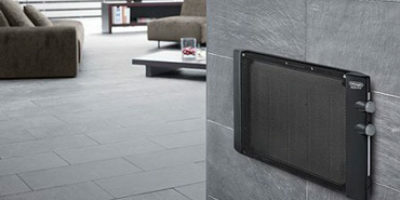 This is a really nice space heating unit as far as looks go, to say the least. 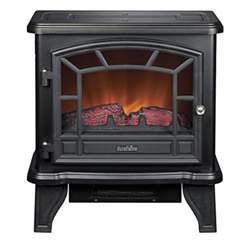 Duraflame obviously took a lot of time thinking about how they could make this unit look more like a real wood stove. Duraflame even thought to add a real working door on the front of it with a decorative handle. Its black matte color is a nice touch also. It even has a simulated glowing ember bed that looks like there is a real bed of coals inside it from a wood burning fire. This is a very safe space heater model too. It’s loaded with very good safety features such as automatic overheat protection and it also has a tip over shutoff switch. One of the best things about the Duraflame Maxwell Electric Stove with Heater is that it stays cool to the touch even when it’s operating. That makes it safe to use around children and pets. 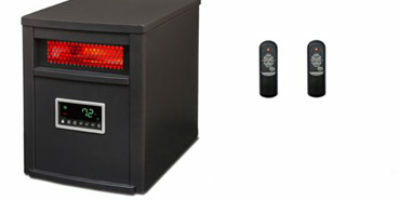 One of the features we really like with this model space heater from Duraflame is its glowing ember bed. That’s a feature that’s a nice bonus and sets this stove and heater combination apart from. Not only does it give the room it’s in a feel like it has a real fire burning inside it but it also adds a little ambiance to the room that has a calming effect. You can turn this feature on and off too if you don’t like to use it all the time. Another nice feature on the Duraflame Maxwell Electric Stove with Heater is, it is relatively lightweight. It checks in at just a little over 18 pounds. That means you can move this heater anyplace in your home that needs a quick extra jolt of heat. Instead of turning up your thermostat and wasting energy heating your entire house you simply use a little extra energy to heat up the room you are currently in. There are few things that could have been better with this Duraflame space heater model. One of them is that there are no color choices with it. All you can get it in is a standard black matte finish. Many users noted that the cord on it is very short too. That means that you need to position it very close to an electrical outlet which is not always possible. Here is a space heater model that looks as good as it works. We all really love its authentic wood stove looks with simulated burning embers inside. 4500 BTU’s of heater power can easily handle adding extra heat to the biggest rooms in your home. The operation is simple and we like the fact it has a full range thermostat. Best of all the Duraflame Maxwell Electric Stove with Heater is very fairly priced too for what you get. Home Air Copyright © 2019. All Rights Reserved. homeair.org is a participant in the Amazon Services LLC Associates Program, an affiliate advertising program designed to provide a means for sites to earn advertising fees by advertising and linking to amazon.com.